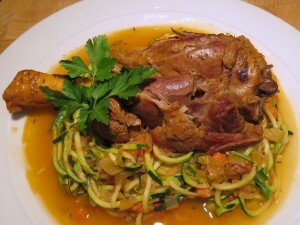 Fox Trot Farm lamb shanks are meaty and tender, and cooking them low and slow in moist heat (braising) brings out every bit of flavor from the bone. Each package contains two shanks and weigh about a pound and a half….the perfect portion for two hungry diners! Oh….I have to say that the aroma that fills your kitchen while these are braising will have everyone trying to steal a peek to see what you are up to in the kitchen! -Defrost, rinse and dry lamb shanks. -Liberally dust with flour, salt, and pepper. -Heat oil in Dutch oven till shimmering. Do not burn. -Remove browned shanks to plate. -Add chopped vegetables to the pan drippings and sauté till they start to soften. -Add garlic, thyme, and tomato paste and stir till combined with vegetables. -Pour 1 cup wine (or chicken broth), and remaining broth into the vegetable mixture. Bring to a boil, then reduce to a simmer. -Return shanks to the Dutch oven and nestle them down into the vegetables and broth. -Tightly cover and turn heat down to low simmer. Braise, turning every 20 minutes or so, for 2 hours or until the meat is falling-off-the-bone tender. -Serve over rice, potatoes, noodles, or just in a bowl with the broth and sop up all that delicious broth with crusty bread or rolls. -One shank is a perfect portion for each person.